← Espanyol vs Barcelona – 100 not out? Deportivo – Down and Out in La Coruna. And so, as is customary in Spain, the final day of the season saw countless permutations existing for the three relegation positions with any of the bottom four teams capable of retaining their top flight status or taking the drop to La Segunda. There were 81 different combinations of results possible to determine who was relegated and who secured the coveted fourth bottom spot. The balance of probability was tipped in Deportivo’s favour with a 55.6% chance of survival, while Celta had a 22.2% chance, Zaragoza 17.3%, and Mallorca had just 4.9%. All four sides were at home but only Depor would meet an opponent with something still to play for in the shape of Real Sociedad. Depor began the day safe. Their fate was entirely in their own hands. Win and they were safe no matter what else happened. The turnaround in fortunes since coach Fernando Vasquez took over after the short and somewhat ill fated reign of Pacienda was palpable. On Thursday, the coach had been carried out of the training ground on the shoulders of many, recognition for what had been achieved, the great escape remained possible. They just had to beat Real Sociedad to complete the journey to safety. Neither side had any key player missing through either suspension or injury for this game. For the final game of the season, Fernando Vasquez went with arguably his strongest line up in their usual 4-2-3-1 with Valeron tasked with providing the creativity from a central attacking midfield position. Similarly, Montanier in his final game with the San Sebastian side named his strongest line up with the potent front four of Agirrexte, Vela, Griezmann and Prieto in place for this crucial encounter. 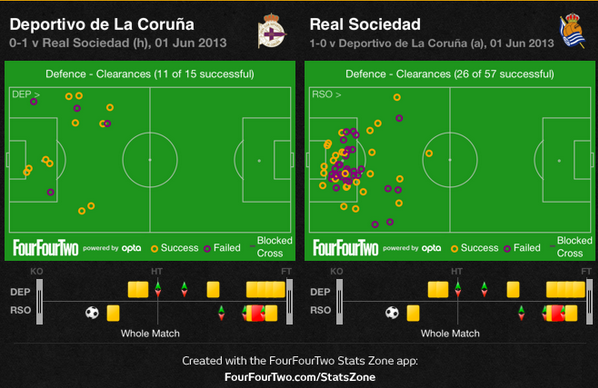 This was a game that both sides needed to win yet Deportivo just never developed any sense of impetus or drive. After a brief flurry ain the opening period, the game settled and Depor lacked guile and creativity. Everything was clogged into the centre of the pitch when Depor had possession, only the full backs from both sides enjoyed any real space. Surprisingly, the veteran Manual Pablo produced a rousing performance which belied both his age and his general lack of pace. 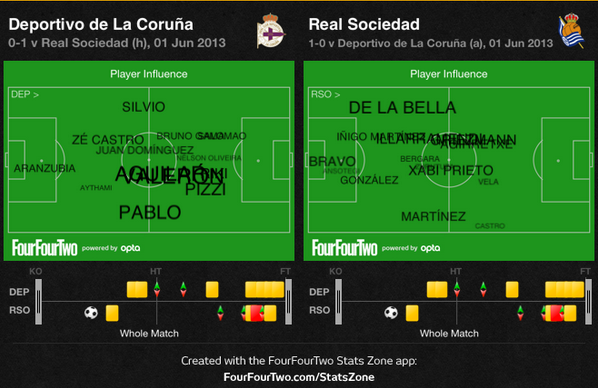 The problem for Depor was the movement of the Sociedad front four. Both Griezmann and Vela come in off the flanks particularly the Frenchman. The full backs may be free then but the central area is overloaded. Their pace and running caused Depor all sorts of problems early on and the home side never really recovered from the damage, both psychological and renewal, that was inflicted. The contrast in how both teams entered the final third of the pitch was stark. Whereas Deportivo continued to build from the back and try to construct attacks moving up the pitch as a unit, Sociedad were happy for the back six to absorb pressure and then let their four main creative outlets strike on transitions. As they have done for much of the season, Sociedad were happy to build play when the opportunity required it but were equally content to go direct if that option existed too. With Deportivo frequently lacking defensive midfield cover, this was always an option for the away side to exploit. 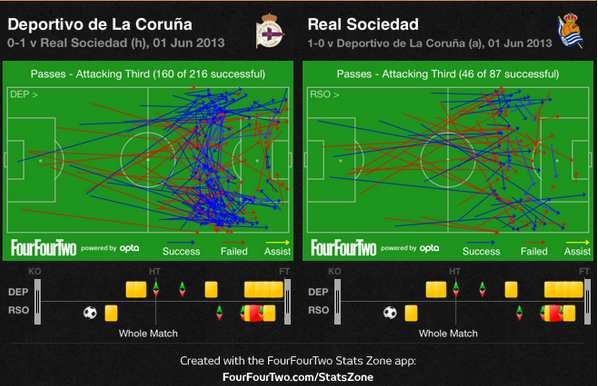 The only goal of the game came after a long ball down the Sociedad left. Once Manuel Pablo had slipped, Depor were in trouble and although Agirretxe’s shot was pushed wide, Griezmann arrived unmarked from the right flank, despite being positioned on the left, to score. Silvio was too close to his centre backs. Deportivo has plenty possession as they moved forward but were unable to translate that possession into the creation of clear cut chances. When they entered into the Sociedad half of the pitch, their ideas ran out and they found themsleves under pressure as their opponents pressed them. Poor play and sloppy passing enable the away side to counter swiftly. 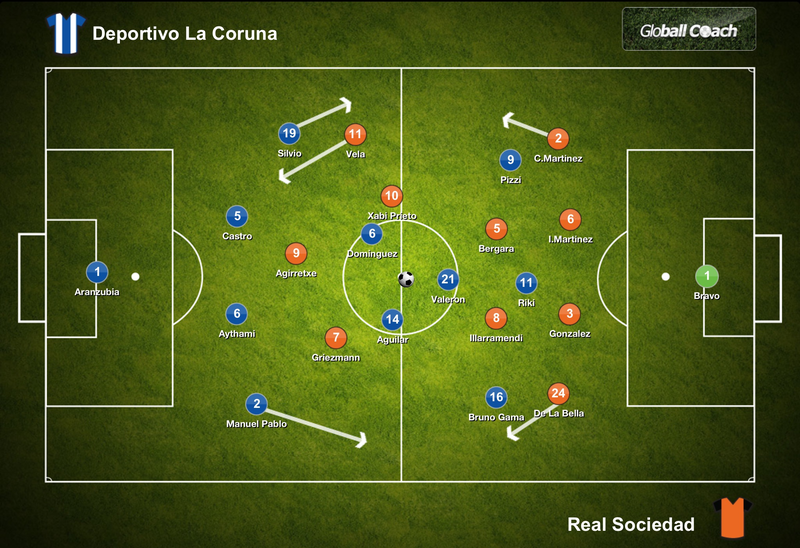 Depor were failing to create at one end whilst aiding their opponents at the other. At the age of 37 years old, Valeron still possesses the guile and creativity allied to the eye for a pass that he always enjoyed. He still glides around the pitch effortlessly but age has wearied him and although never blessed with great pace, the increased physicality of the game has squeezed him. He still provided numerous highlights in his swansong season for Depor such as the deft chipped pass to Riki for the opening goal in the final Galician derby of the season. A game that reignited the sense of belief in Depor. His deeper positioined allied to the inability of players to get into the penalty area rendered Depor ineffective in attack. Indeed, the home side’s best opportunities arose after Monatanier withdrew Vela for Zurutuza. The more defensive substitution allowed Deopr to take the intiative as Sociedad retreated somewhat towards a much deeper block allowing Depor to advance. Some half chances were created by Bravo was never seriously tested, his biggest difficulty being his own nerves for a brief spell. As outlined, Depor did not struggle for possession in this game with 60% but they could not convert that possession into goals or even clear chances. Part of the problem must reside with their reluctance to commit men forward for fear of being caught out on quick transitions from Sociedad as evidenced by the opening goal and a handful of other chances in the first half that really should have seen the away side clear by half time. A pattern of play developed whereby a cross was delivered into the box, cleared and loose possession collected by a Depor player who would attempt another cross etc etc. 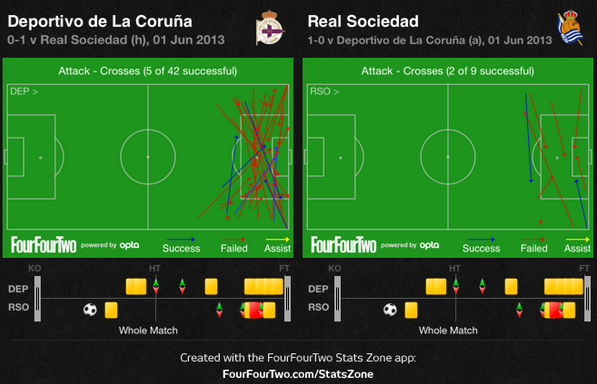 Everything was happening in front of the Sociedad defence. By striking first, Sociedad were in the perfect position to utilise their skill set, defend, absorb pressure and strike on counters. Depor return to the lower tier after just one season back in the top flight. The sad truth is they were simply not good enough to sustain themselevs no matter how much they fought. Their final seven leagues witnessed a return of just six points. Their Galician neighbours Celta Vigo meanwhile, somehow avoid the drop. Despite being without their best player, Iago Aspas, for five weeks due to suspension after he inexplicably headbutted an opponent in the Galician derby, they survive. Deportivo find themselves saddled with a debt estimated at €156m. Despite the advert of parachute payments, the drop will herald a new era for the club once called Super Depor. A side built upon youth team members will emerge with the likes of Valeron retiring whilst others depart for pastures new. The final word must go to Real Sociedad and the job Montanier has delivered. Following a comfortable if underwhelming mid table finish last season, the side have grown this season expressing their personality. With just two defeats in their final 21 league games, Sociedad deserve the final Champions League position. And after a 10 year absence, Real Sociedad have the opportunity to return to the Champions League should they successfully qualify through the final preliminary round. They will do so with a new coach at the helm but if the squad remains intact and can be strengthened a little, they should be able to cope with the demands that European football will place on them.